A required course for majors pursuing sports medicine, exercise science, nursing, or sports therapy degrees, kinesiology is central to a variety of fields. 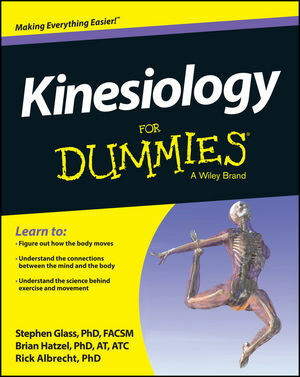 Kinesiology For Dummies tracks an introductory course in the science and imparts the basics of human body movement. With this resource, you will learn how physical activity can alleviate chronic illnesses and disabilities, what factors contribute to musculoskeletal injury, and how to reverse those influences. Complete with a 16-page color insert of medical instructions, this book covers the basics of exercise physiology, exercise and health psychology, introductory biomechanics, motor control, history and philosophy of sport and exercise, and mind-body connections. Interested learners, kinesiology students, and health or sports therapy professionals will benefit from this refresher course in the basics. Dr. Steve Glass is a Professor in the Department of Movement Science at Grand Valley State University. Dr. Brian Hatzel is an Associate Professor and Department Chair in Movement Science at Grand Valley State University. Dr. Rick Albrecht is a Professor and Sports Leadership Coordinator in the Department of Movement Science at Grand Valley State University.